But what happens when truth becomes relative? Apparently Beauty as a consideration disappears, but we still yearn for it, search for it and appreciate it when it does appear. And by Beauty I don’t mean merely pretty. Real beauty is evocative. It allows you to see anew. It lingers. It is refreshing. There are still writers working who use moments of beauty or lovely language in their writing. Denis Johnson comes to mind. For most writers (well, good writers) language itself is important and part of the craft is creating beautiful sentences, reiterating imagery and themes in various ways. Jesus’ Son is one of the best examples and it’s achieved by looking very closely and then not settling for the first cliche that comes to mind. 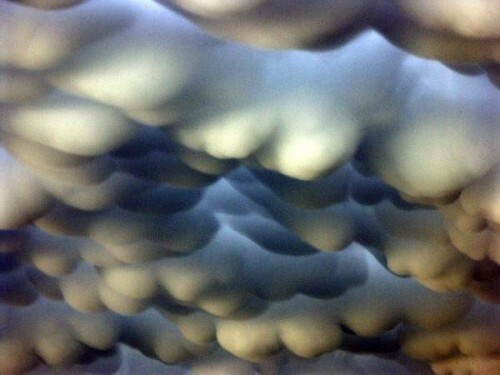 Instead, “The jolt of fear burned all the red out of my blood.” or “Midwestern clouds like great grey brains…” (those are mammatus clouds in the thumbnail above) Stop and consider beauty, even (especially) that which is unconventional, and you might create images that stick with your reader.